Not everyone would embrace their inner caveman, but in today’s Slate Ann Gibbons sure did. Gibbons, who also writes for Science, is the author of the book The First Human: The Race to Discover Our Earliest Ancestors. Over almost two decades, she’s delved into the discoveries around human evolution. In her Slate piece she writes about getting tested by 23andMe. 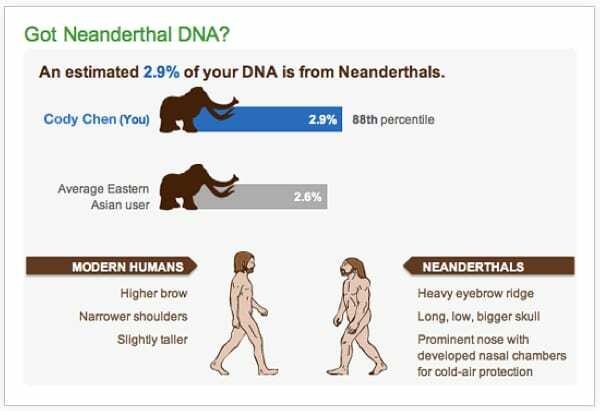 While she was interested in her European ancestry, what really drew her in was the portion of her results that showed she has 2.9 percent Neanderthal DNA. For someone who has spent years writing about the march of mankind from our earliest ancestors to the emergence of modern humans, finding a tangible link to the past is powerful stuff. The PBS show NOVA scienceNOW recently aired a piece that nicely crafts a story about what it means to humans to share Neanderthal DNA. For a lot of us here, although Neanderthals disappeared long ago, it’s most intriguing that their DNA continues to live on in all non-African people. 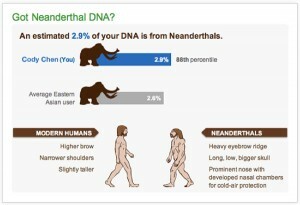 It may be that the DNA of other prehistoric human groups also are intermixed in our own DNA. Much like with Neanderthals, scientists extracted ancient DNA from the skeletal remains of another ancient cousin known as the Denisovans. The remains – a finger bone – was found in a cave in Siberia, showed that Denisovans were cousins of Neanderthals, who lived in Asia and disappeared about 40,000 years ago. Their DNA is found today in Melanasians.